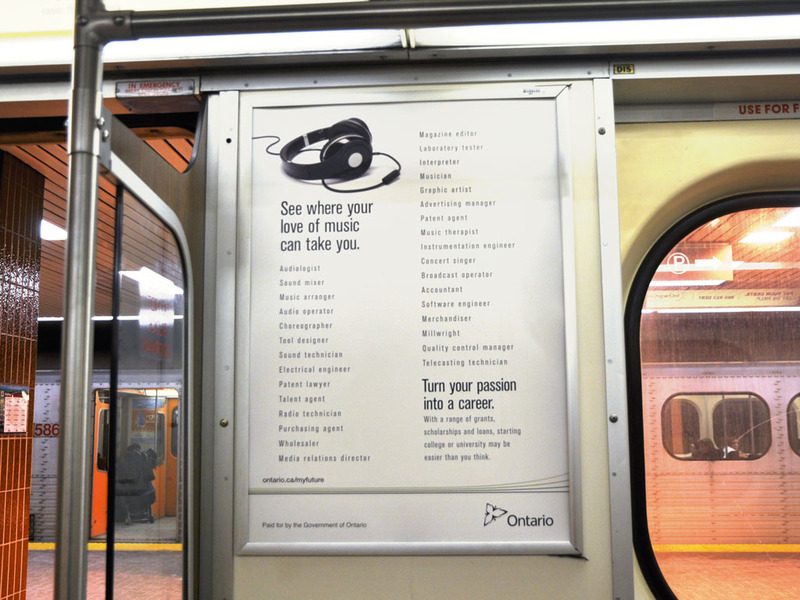 Kudos: Ontario Government influences citizens to use passion as a base for practical creative thinking (under the radar) | New Ideas. New Decisions. Creativity. Sir Ken Robinson and others recommend shifts in education to teach children how to think creatively. Creativity professionals show, educate, facilitate and research many tools to accomplish this for organizations of many kinds. 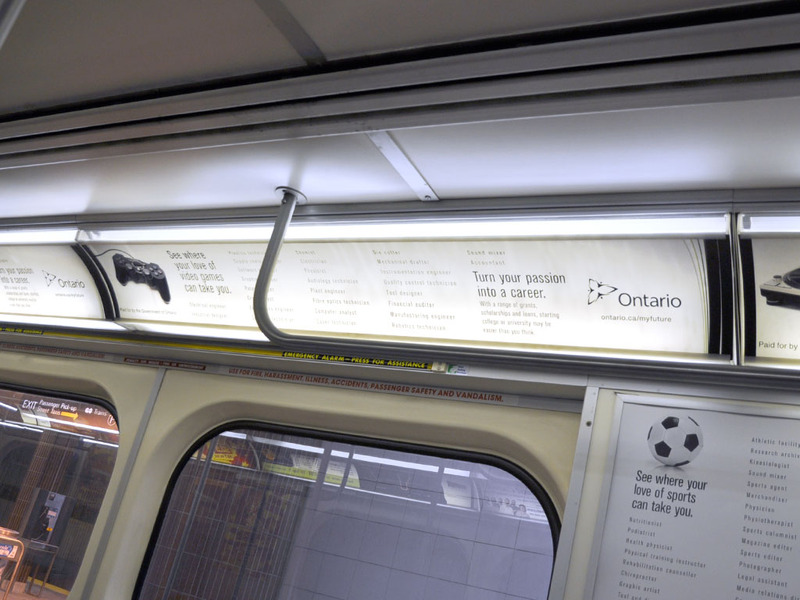 The Ontario Government’s transit ads provide simple and practical examples of how this creative thinking two-step is done. They show many and varied occupations which can be linked with passions in music, cosmetics, sports and the like. Click on the thumbnails to see how long the lists are. Thanks OPS. You are doing what others are in the midst of talking about doing formally. You are ahead of the education and human resource/leadership policy makers by moving right to action. Kudos! Come to think of it, who would ever imagine that the TTC and the OPS would get together to teach creative thinking? Thanks to Zoryana Loboyko of phd canada and Bill Hicks of CBS Outdoor for these shots. 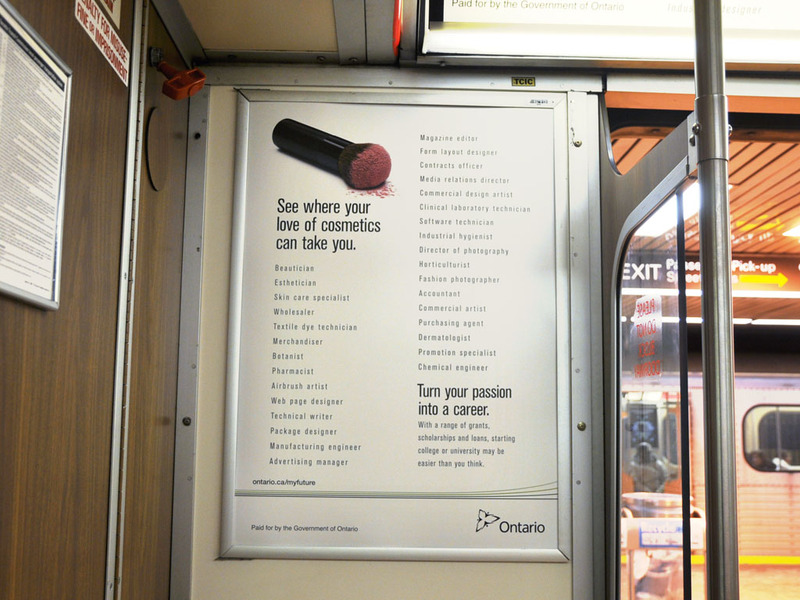 This entry was posted in creativity general and tagged Bill Hicks, CBS Outdoor, creative thinking, creative thinking two-step, creativity, Creativity two-step, Education, education for creativity, Ontario, Ontario Government, OPS, passion, phd canada, Sir Ken Robinson, transit ads, TTC, Zoryana Loboyko. Bookmark the permalink. Pingback: Creativity: Next Step (V) World Creativity and Innovation Week Personal Project | New Ideas. New Decisions. Creativity.